Microsoft Reader is a free ebook reader that you can use on Windows computers and Windows Mobile devices. Its main feature is the use of what Microsoft calls “ClearType” technology. Personally, I don’t think it looks any clearer than regular font typing, but it does make the text in Microsoft Reader ebooks look a lot more like type on paper. Microsoft Reader provides a more book-like reading experiences than other ebook software. In this post I will be going over everything you’ll need to use Microsoft Reader ebooks successfully on both Windows and Windows Mobile. If you’re not sure whether your phone/device runs Windows Mobile, check this list of devices. These instructions assume that you’ll be buying and downloading DRM-protected ebooks. Most book publishers require DRM on their downloads because they are concerned about software piracy (too concerned in my opinion, but that doesn’t change anything.) If you find a Microsoft Reader ebook that is not protected by DRM, then you won’t need to have your copy of Microsoft Reader “activated”. However, I still highly recommend that you follow the activation procedure anyway because it is likely that you’ll want to get a DRM-protected ebook at some point, and it’s much better to be prepared for it ahead of time. Secondly, these instructions assume that you will be using the ebook on a Windows Mobile device. If you are only planning on using your ebook on your computer, then you can just skip the Windows Mobile instructions. You might already have a Windows Live ID. You have one if you use Hotmail or Windows Messenger. If you’re not sure whether your have one or not, especially if you’ve already bought some Microsoft Reader ebooks, make sure to check for an existing account. This is quite important. If you have downloaded DRM-protected ebooks in the past, you will have used a Windows Live ID, whether you remember it or not. If you activate Microsoft Reader with a different ID now, you’ll lose access to those ebooks. If you definitely don’t already have a Windows Live ID, sign up for one now. – Just like any other program, begin the installation and follow the on-screen instructions. Note: You must do this even if you only plan on reading the ebook on your Windows Mobile device. Microsoft Reader will be using your computer’s Microsoft Reader activation information during the transfer of the ebook to your device. If you aren’t already signed into your Windows Live ID, you will be prompted to do so. Note: You must perform this activation for Microsoft Reader on your computer even if you only plan on reading the ebook on your Windows Mobile device. Microsoft Reader will be using your computer’s activation information during the transfer of the ebook to your device. It will check to make sure that your computer and your Windows Mobile device have been activated using the same Windows Live ID. 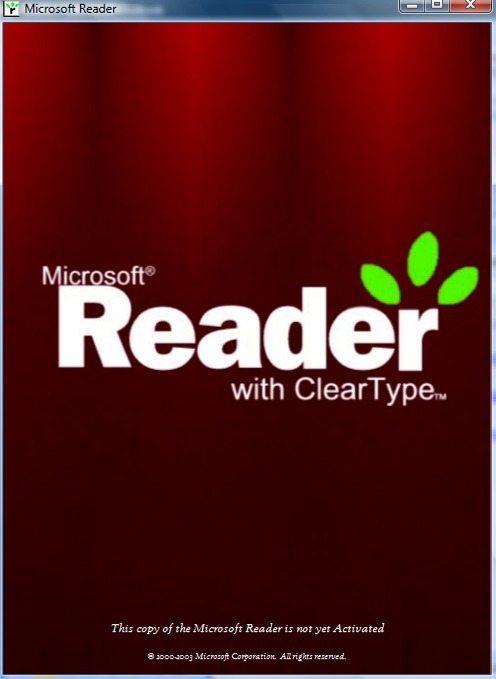 You might already have Microsoft Reader installed on your device. If you do not, or if you have an old version, you can get Microsoft Reader for Windows Mobile here. That page outlines all of the compatible versions of Windows Mobile, and there are installation instructions at the bottom of the page. This page gives detailed instructions on how to activate Microsoft Reader on a Windows Mobile device. Make sure to activate using the same Windows Live ID that you used when activating Microsoft Reader on your computer. If you do not, you will have a lot of trouble with transferring ebooks between your computer and your device. The Sealed ebooks offer the lowest level of security. You can’t copy text from the ebook in more than about once sentence at a time, the file can’t be converted to other file types, and you can’t print the ebook. Inscribed ebooks show the user’s name on the front cover of the ebook. This is to discourage users from giving the ebook away to others. The security features from the Sealed level also apply. Owner Exclusive is the highest level of security. These ebooks can only be used when Microsoft Reader is activated with the correct Windows Live ID. The security features from the Sealed level also apply. Like Adobe Digital Editions, Microsoft Reader can be easy to use as long as you follow instructions and activate the software correctly. Microsoft Reader is a good alternative to Adobe software if you’re using Windows or Windows Mobile. Adobe files are better at displaying images, charts, graphs, and other visual extras, but Microsoft Reader is better at displaying text. I’d make my format choice based on that – will you be mostly reading text or looking at visual displays?